Foodista | Recipes, Cooking Tips, and Food News | Creamy Baked Seafood Casserole, A Yummy Treat For All! Creamy Baked Seafood Casserole, A Yummy Treat For All! Preheat oven at 200°C for convection oven. Heat oil and butter in pan. Sauteed garlic and bacon till fragrant. Add seafood, and the rest of the ingredients. Mix well and transfer to casserole when they are about half cooked. Top with cheese. Be tantalized by the kaleidoscope of flavours from the ocean drenched in a sourish creamy sauce that's bound to whet your appetite. 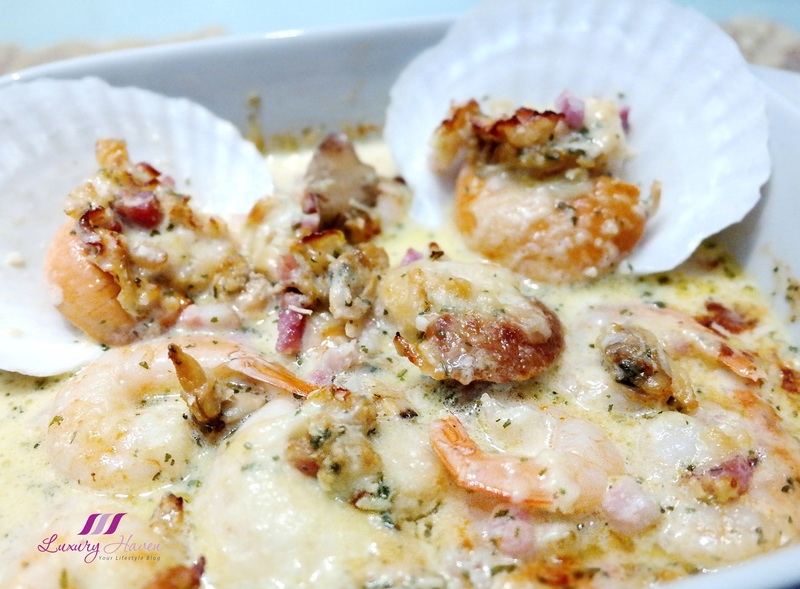 If you are a fan of shellfish, you will enjoy this Creamy Baked Seafood Casserole that is filled with shrimps, scallops and clams, and baked to golden brown with a cheesy topping.